The Amazon Villa • Use the form below to contact us directly. Fill in the fields to check availability & reserve direct with The Amazon Villa. 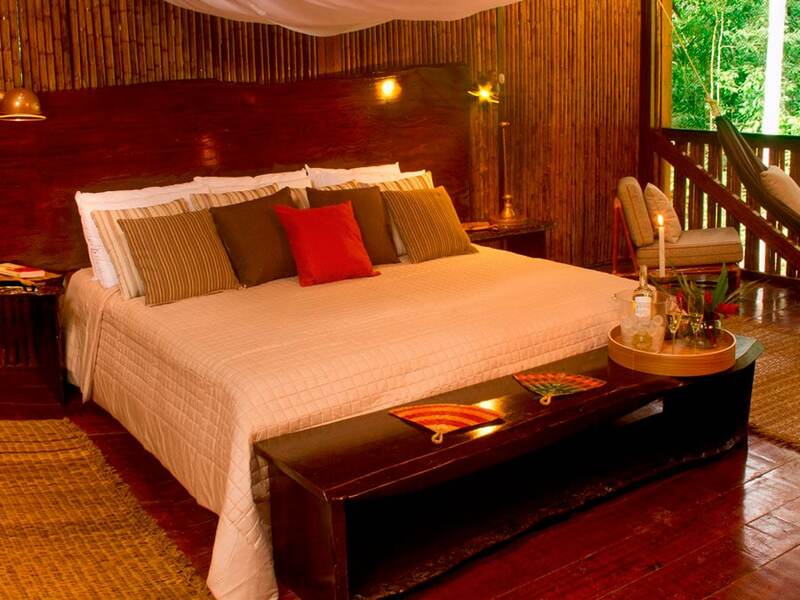 Explore the Amazon Rainforest in comfort on a premium experience at the Tambopata Amazon Villa. 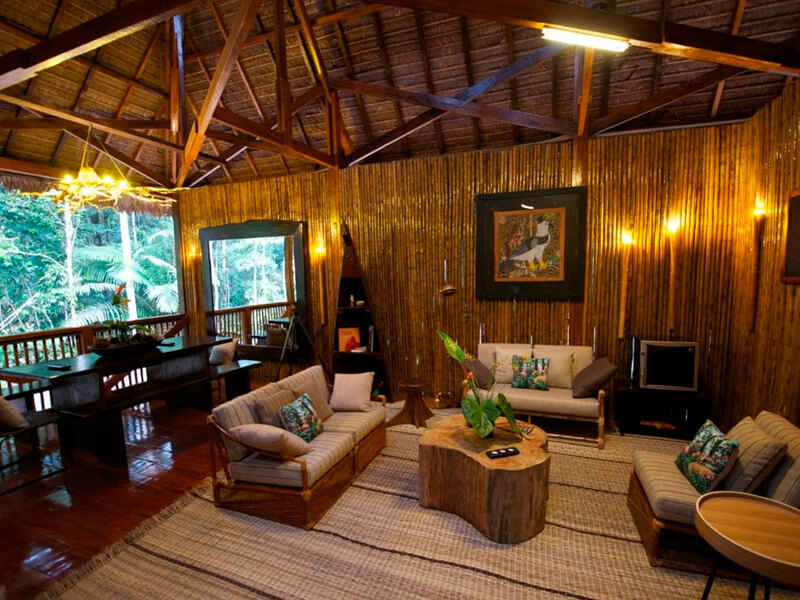 The Amazon Villa is a private bungalow in the middle of the rainforest designed to offer guests comfort, privacy, amenities and a practical way of experiencing the Amazon. 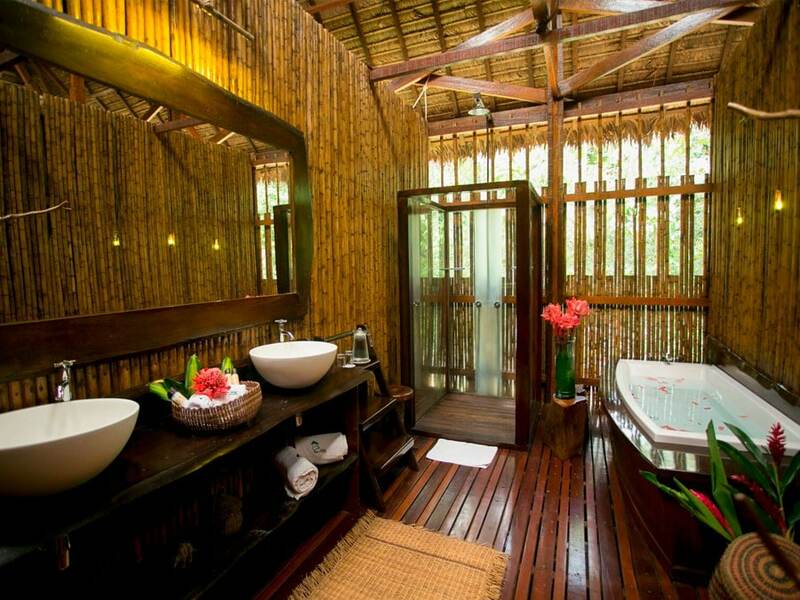 You will enjoy your own bungalow in the jungle to relax among incredible sights and the sounds of nature. 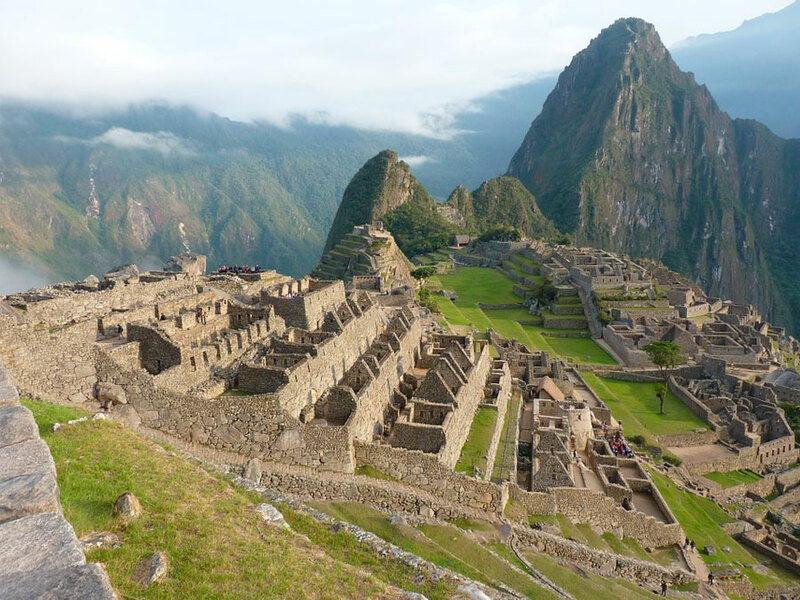 From the comfort of the villa, enjoy passing monkeys, colorful birds, and romantic dinners of delicious Peruvian cuisine. Your premium experience starts from your collection at Puerto Maldonado airport and doesn’t end until your return. 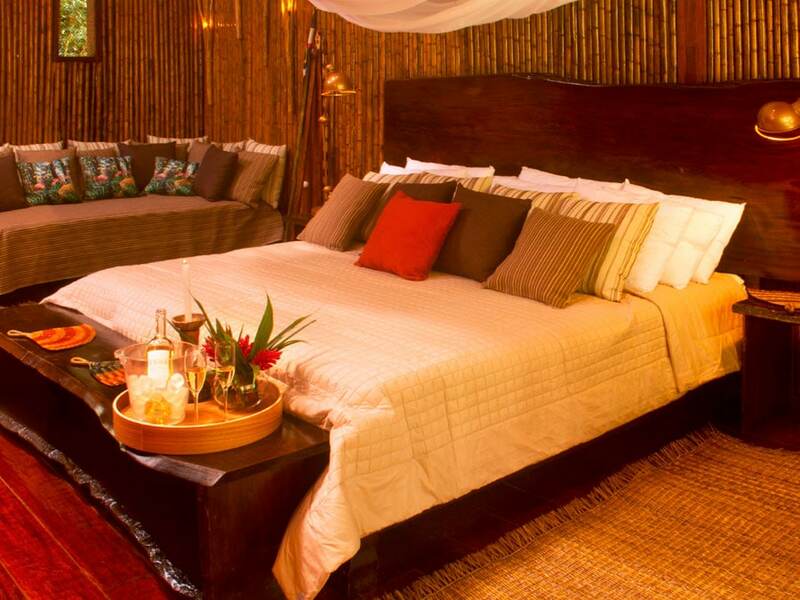 Who will enjoy stays in the Amazon Villa the most? 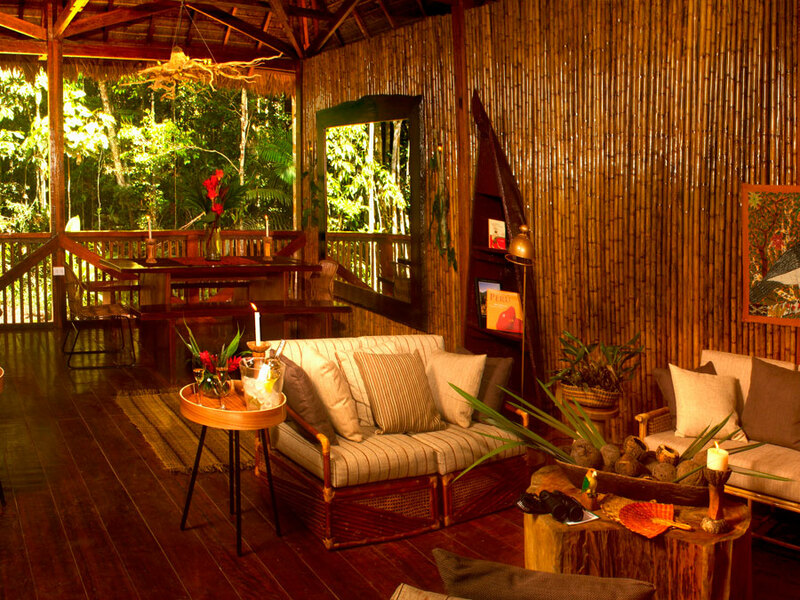 Honeymoons & Romantic Getaways: The privacy and pristine surroundings offer an intimate experience of the fantastic Tambopata rainforest. Add our exciting activities to the trip and it becomes a romantic jungle adventure. 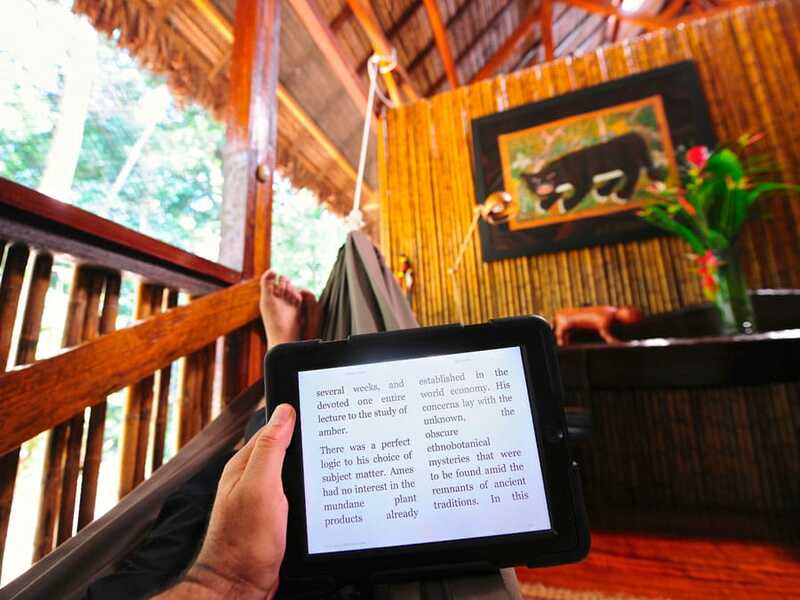 Writers and painters: Make the most of the naturally relaxing ambience of the rainforest and its inspiring wildlife, noises and views. Enjoy the privacy and comfort to concentrate on your next project free from the stresses of a busy life. You will only be bothered to ask if you would like a trip to a canopy tower, watch macaws on a clay lick, or visit a pristine jungle lake for further inspiration. 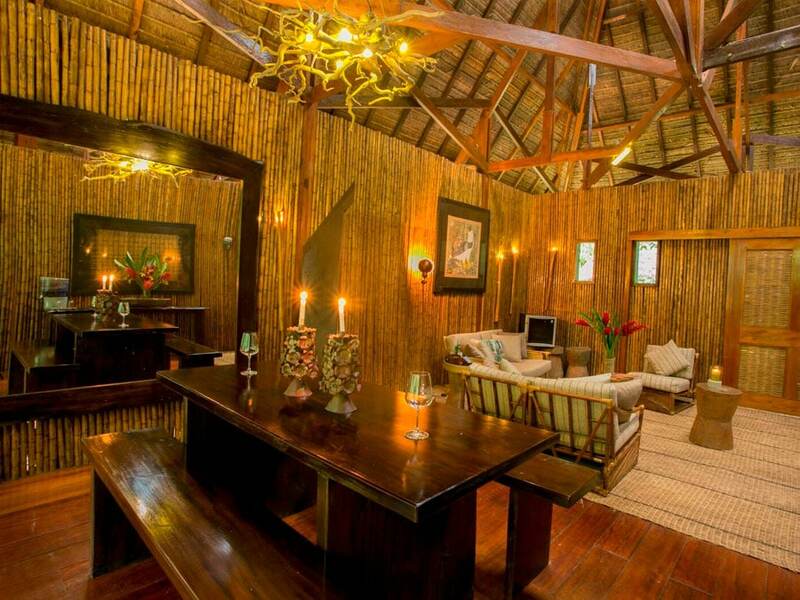 Guests who like exclusive privacy: If you would like a lot more privacy than a usual Amazon rainforest lodge, the Amazon Villa is ideal. 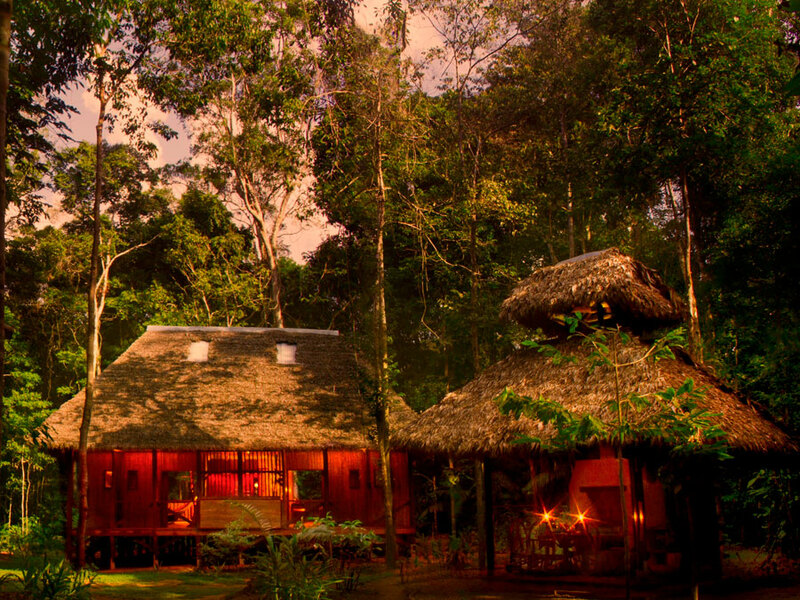 There are no roads in the area and your only neighbors are a 15 minute walk away at the Refugio Amazonas Lodge. Not to mention, you don’t share any of your activities with other guests. A working vacation: Enjoy free time, comfort, space and privacy to concentrate on your project, whether it be a design, software, blog, or other project. Just remember to take some time off for fishing, climbing into the canopy of the rainforest, and enjoying fantastic Peruvian cuisine. 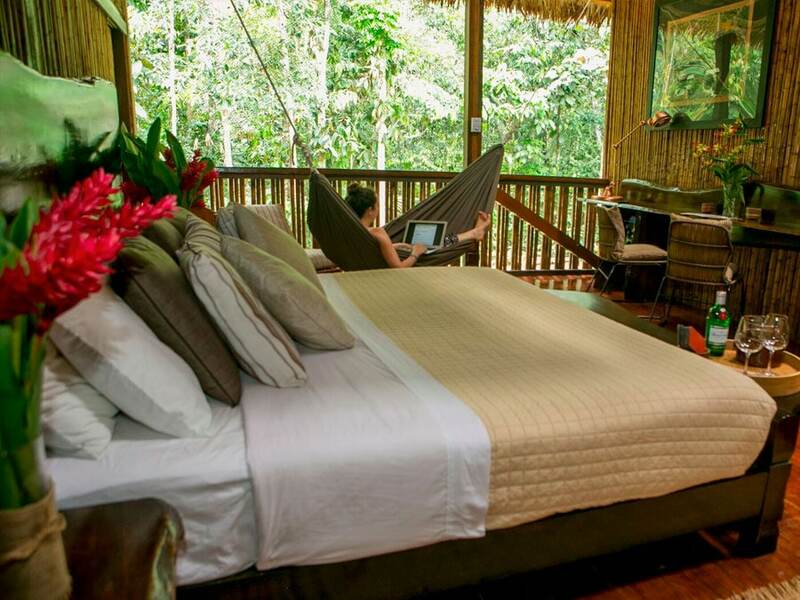 By choosing the Amazon Villa in the Tambopata Amazon Rainforest, you can enjoy any of the following activities, or simply relax in the privacy and comfort of your exclusive villa. Tell us how you wish to spend your time because this is your exclusive trip and we want to make your experience of the Amazon Rainforest nothing short of amazing. Although you are completely separate from the Refugio Amazonas Lodge, if you ever fancy a drink at the bar, enjoy a meal or two there, or to socialize with other guests from time to time, you are more than welcome to walk over when you wish (a 10 to 15 minute stroll). Mountain biking in the rainforest: Experience the beauty and excitement of the Peruvian rainforest along ten kilometers of trails! We provide a GT mountain bike, helmet and cycling gear, water bottle, and your very own mountain bike guide. Kayaking on an Amazonian river: After a short hike along a jungle trail, your kayaking guide will get you geared up for one of the best ways to experience the rainforest. 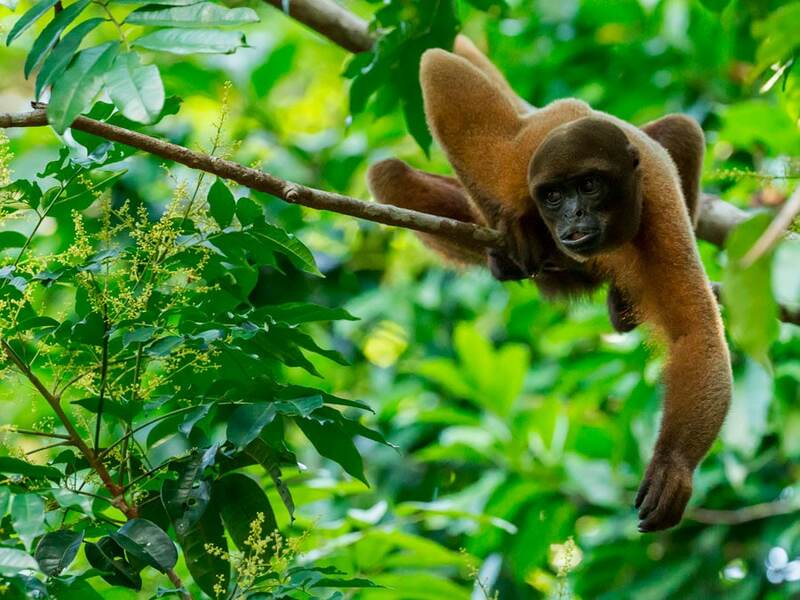 Your guide will quietly kayak with you along the edge of a river flanked by majestic rainforest to look for monkeys, exotic birds, caimans, and other rainforest wildlife. We will also make a stop at a sandy beach for a dip in the river before heading back to the bungalow. Canopy climbing: The canopy of the rainforest is where most of the action takes place and this activity brings you up into this exciting, little known realm. Two experienced, certified guides will take you to a massive Brazil Nut Tree and make sure that you are equipped with a helmet, harness, and gloves before showing you how to safely ascend high up into the tree with the Jumark technique. This is the same technique used by our Macaw Project researchers and other scientists who study the canopy and the ascent will bring you to a canopy platform 30 meters (100 feet) above the ground. 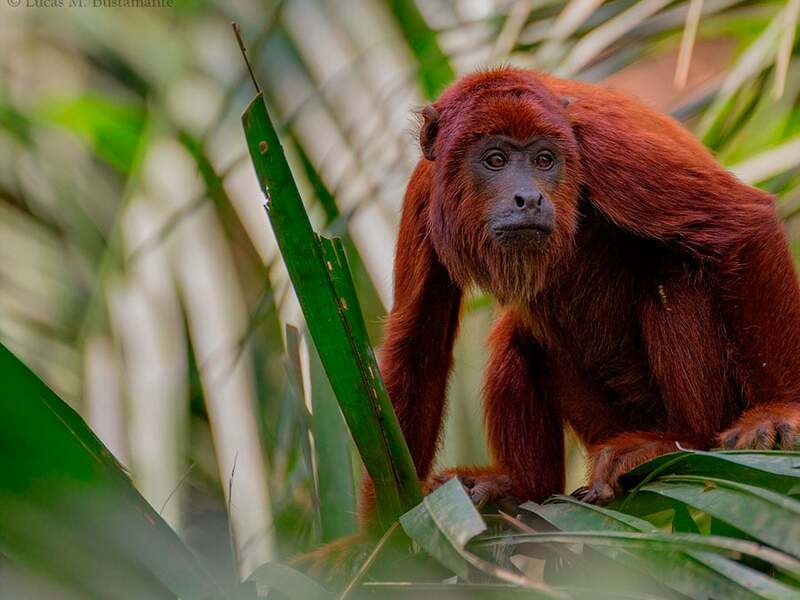 The view of the river and surrounding rainforest is incredible and you will have a good chance of seeing macaws and parrots flying over the roof of the rainforest, and may also glimpse monkeys as well as other wildlife. Star gazing from a canopy tower: The Amazon jungle is a fantastic place for star-watching due to the lack of ambient light. On clear nights, it looks as if the entire Milky Way Galaxy is right overhead and if you decide to do this activity, you get the chance to gaze at those stars from a 30 meter canopy tower. After dinner, a guide will accompany you to the tower along with a telescope for star gazing and a star gazing field guide to help identify constellations, distant nebulas, planets, and other features of the Amazonian night sky. Caiman watching: This is another of the night activities possible during stays at the Amazon Villa. After a guided hike along a jungle trail, guests board a boat and search the edge of the river for caimans and other nocturnal creatures. You won’t have to get out of the boat to see the caimans and the guide doesn’t grab them. Paddle Board: Paddle boarding is an easy, fun way to experience the river. We do this exciting activity at either sunrise or sunset because these are the times of the day when animals are most active. While paddle boarding along the edge of the river, we will look for monkeys, caimans, and other rainforest wildlife. A paddle board, paddles, life jacket, and experienced guide are provided. Brazil Nut Trail: Brazil Nuts are such an important part of Peruvian Amazon life and the local economy that it’s illegal to cut these massive trees down. A guide will take you along a trail that passes beneath several of these rainforest giants and will tell you about this important tree and the nuts it produces. You will also get the chance to taste some of the delicious products made from Brazil Nuts. Helmets are provided and worn during the nut harvesting season. Canopy Tower: Many of the trees in the Peruvian Amazon grow to heights of 30 plus meters (100 feet or more). It’s a challenge to see birds that frequent the tall canopy of the rainforest but only if you look for them from the ground. 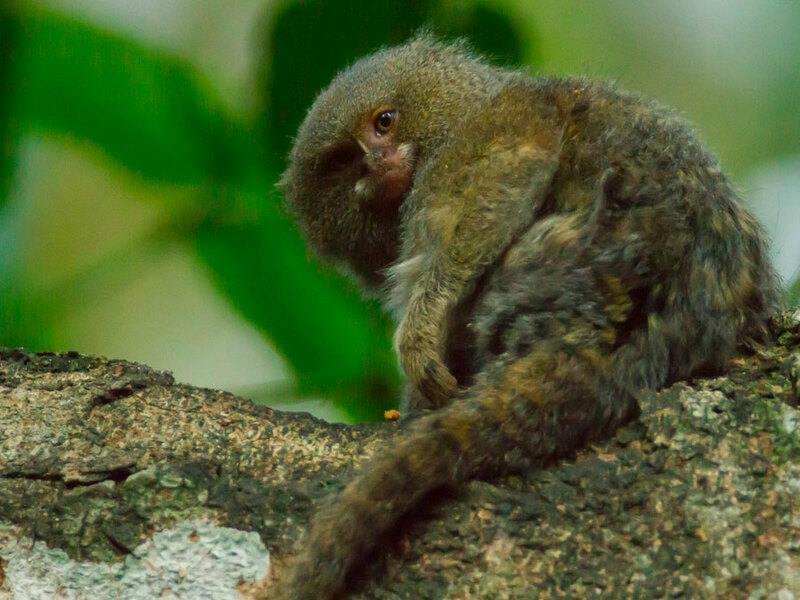 Watch for them from a canopy tower and you can get close, eye-level looks at colorful toucans, parrots, macaws, tanagers, jacamars, trogons, woodpeckers, monkeys, and other rainforest wildlife. 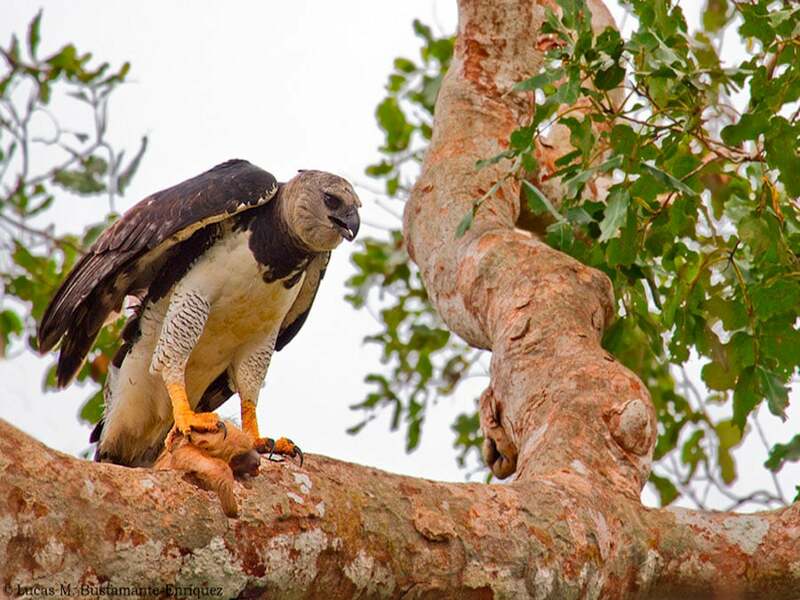 On this fun, unique activity, one of our experienced guides will bring you to the canopy tower to help you look for and identify birds and other rainforest animals. Your guide will also talk about the different levels of the forest as you visit different platforms on the tower. An ethnobotanical tour to a local farm: Your guide will walk with you to the river and after a 15 minute boat ride, you will visit a small farm where a variety of plants are grown for food, decorations, and medicinal properties. 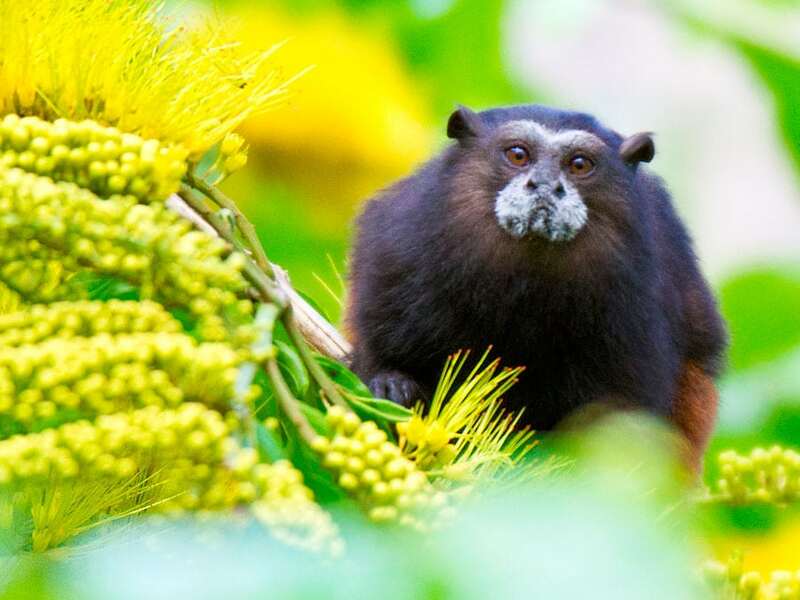 Your guide will explain local Amazonian agriculture processes and will also tell you about Camino Verde, an NGO involved with the reintroduction of native species and reforestation. Your guide will also bring binoculars and a spotting scope because the farm can be very good for birdwatching. A full day at beautiful Lago Sachavacayoc: On this exciting activity, your personal guide will bike with you for 2 kilometers through the rainforest before continuing on foot for 4 more kilometers to reach a big oxbow lake in the middle of the jungle. 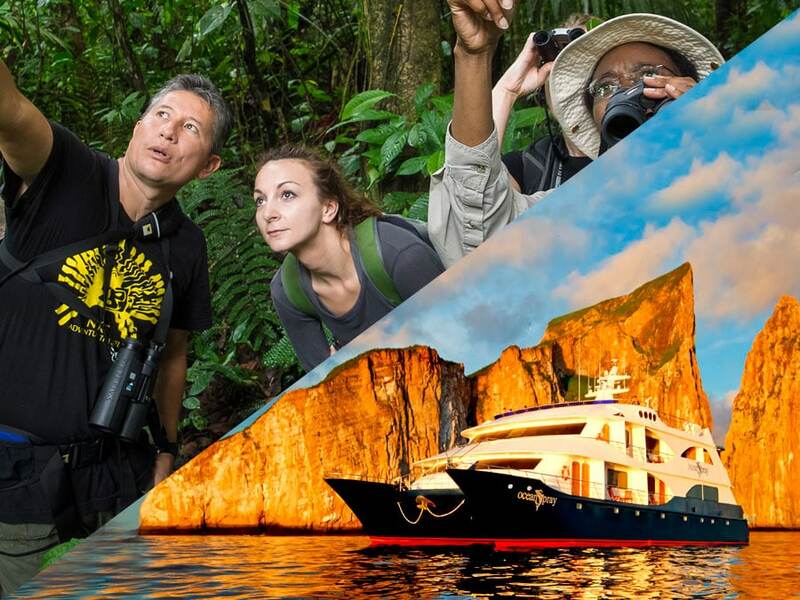 On the way, you will learn about various aspects of the rainforest, and look for birds and other jungle wildlife. At the lake itself, you can take a canoe to explore this beautiful, tranquil body of water before enjoying a picnic lunch. 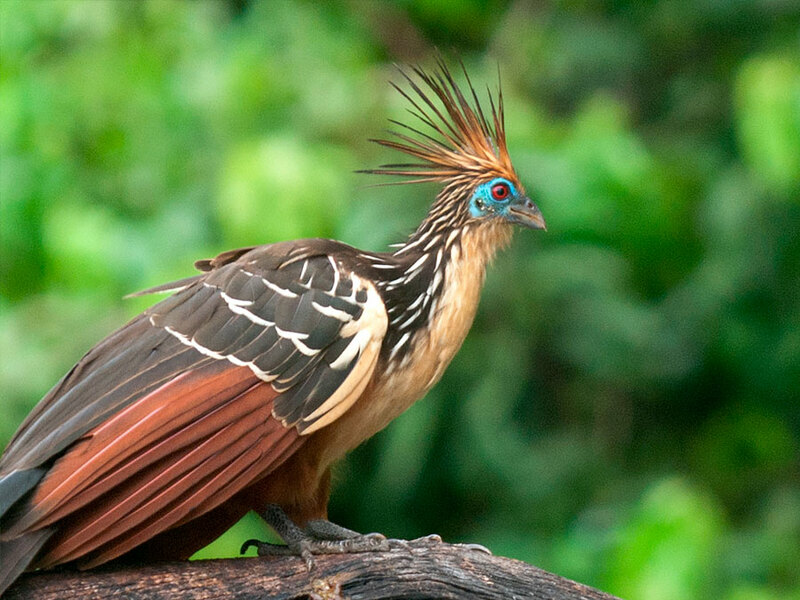 This is a great activity for seeing lots of birds and experiencing the wild Peruvian jungle and is not visited by guests of Refugio Amazonas. 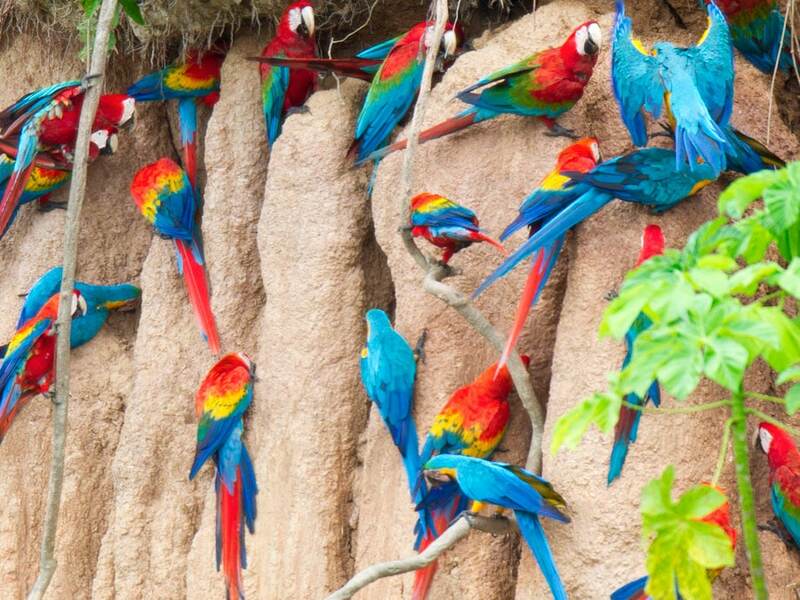 A trip to a parrot claylick: In the Tambopata area, several parrots, parakeets, macaws, and even mammals visit certain areas in the rainforest to east clay. On this activity, your personal guide will take you by boat and a short hike to a claylick frequently visited by parrots and other animals. 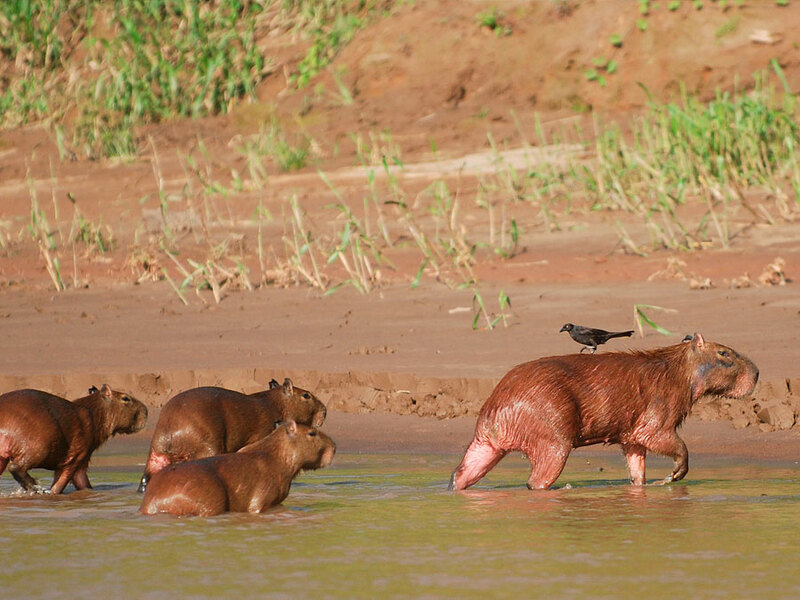 Your guide will also explain why many animals in Tambopata eat clay and bring you to a beautiful stream for a snack and dip in the water. Swimming in the river: If you feel like cooling off by swimming in an Amazonian river, your personal guide will take you by boat to a nearby beach. There will also be snacks and water available. Fishing: Feel like going after some of the fish that live in the river? If so, a guide will bring fishing equipment and take you by boat to a spot in the Tambopata River that can be good for big catfish, the hard fighting Vampire Fish, and other species. While catching a fish is never guaranteed, this makes for a fun couple of hours on the river and you will learn about some of the fish that live in the waterways of Tambopata. 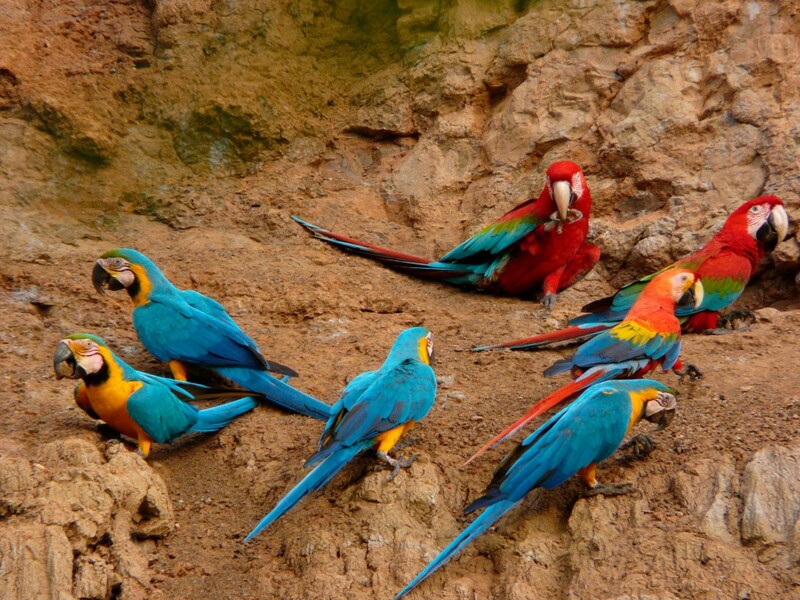 A trip to a macaw claylick: Take a morning trip to one of Tambopata’s famous macaw clay licks. This one is three hours by boat from the bungalow and is often visited by three species of macaws, parrots, and parakeets. Your guide will help you identify the birds and animals seen at the claylick and along the river with binoculars and spotting scope. A Night Walk through the Jungle: Most of the rainforest comes to life after dark. This makes the night the best time of the day to see bizarre and beautiful frogs, insects, and other nocturnal animals. Your guide will take you on a trail that leaves from near your bungalow for an hour and a half exciting night hike into the primeval Amazon rainforest. Sunset boat ride on the Tambopata: Sunsets in the jungle are beautiful and one of the best places to enjoy them is from a boat on the Tambopata River. In the afternoon, your guide will take you to a waiting boat for an easy-going, two hour ride on the Tambopata River. Your guide will talk about the dynamics of this Amazonian river as you watch for rainforest wildlife and see macaws fly overhead before enjoying the jungle sunset accompanied by a bottle of wine. Rainforest craft workshop: Would you like to learn how forest materials are used to make clothing, baskets, and works of art? Just let us know and we can have local artisans meet with you and your family any time of the day. Your guide will act as interpreter as they show you how people in Tambopata have made baskets, clothing from tree bark, and earrings from certain rainforest seeds for hundreds of years. 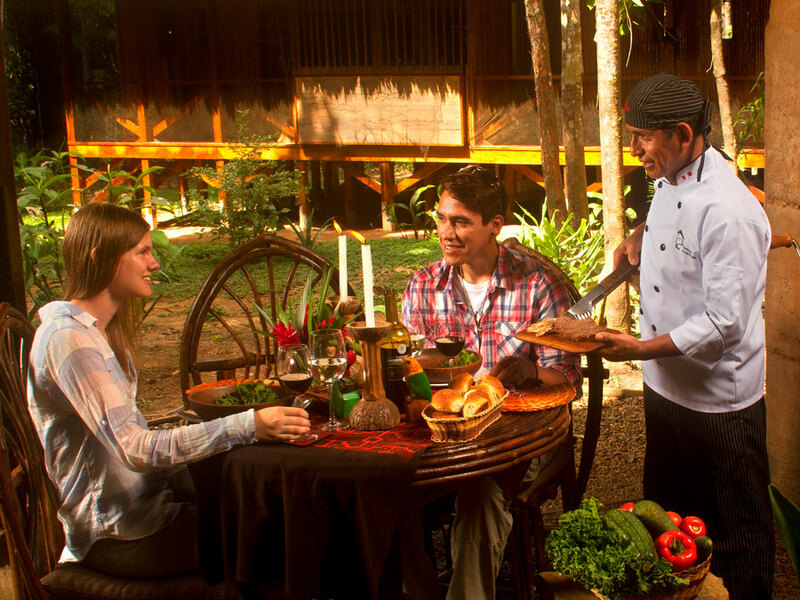 Finish off your stay at the Amazon Villa with a picnic dinner around a cozy fire: While enjoying a delicious dinner next to a campfire and being surrounded by the rainforests of Tambopata, your guide will entertain with stories and local legends from the area.